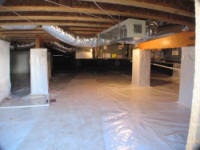 Triad Spray Foam provides the ultimate conditioned sealed crawl space design that will transform this normally damp pest infested area into a nice mold and mildew free space that dramatically improves the energy efficiency, comfort and indoor air quality of the home. 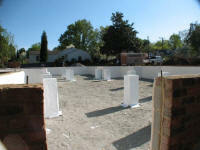 Our conditioned sealed crawl is a 3 stage process that includes 3 separate trips to the job site. The first stage includes completely encapsulating the piers with 12 mil poly to seal out any possibility of moisture wicking through the block and into the crawl space. In addition, we insulate the walls with 1-1/2” of closed-cell foam and permanently seal 12 mil poly to the walls of the crawl space. A flap is left around the base of the wall and piers to attach to the floor poly at the end of construction. After the house is under roof, Triad Spray Foam will come back to the job site and lay 6 mil poly across the floor of the crawl space. This prevents the growth of mold and mildew during the construction process when the house frequently gets wet. The final stage of the process comes when the house is completed. 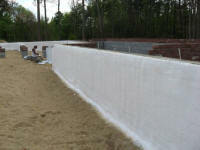 At that time Triad Spray Foam will come to the job site a third time. This time we spread 12 mil poly over the 6 mil and seal it permanently to the flaps around the walls and piers with water proof sealing tape. Also any seams will be overlapped and sealed in the same manner. Once completed this space is as clean and comfortable as any room in the home. It will provide a much healthier, mold free and energy efficient home. 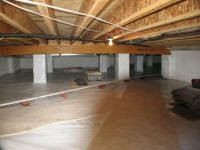 A Conditioned Sealed Crawl Space Makes The Crawl Space Look And Feel Like Another Room In The House Which Will Increase The Value of the Home.